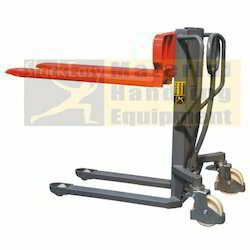 We are largest supplier and importer of Hydraulic Hand Stacker. Features: AC motor, no brush, maintenance Free, greatly saves the cost. - High quality mast steel ensures rigidity, durability. - Integral pump, which prevents loosening, leak-proof. - High efficiency pump, operating lighter& comfortable. - Set the active safety valve to prevent overloading of use. - Maintenance-free design, ensures security, reduces service cost. Light in weight, these Stain Steel Hydraulic Pallets are offered in the market in complete safe form. Moreover to this, engineers finely test these pallets before supplying n the market. Best quality steel is used for making of these pallets. Additionally, these pallets are reliable and do not get damaged by continuous working. With a main aim to accomplish high level of patron trust, we have been engrossed in providing a vast assortment of Hydraulic Stacker. Our wide range of motorized hydraulic stacker is manufactured using high grade raw material such as SS, MS, alloy steel, etc. These hydraulic stackers are used for automobile component industry for die loading and unloading for a press. 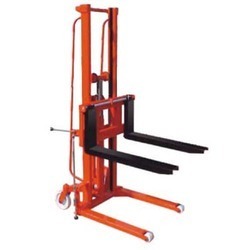 We design and fabricate hydraulic stacker as per the dimensional specifications provided by our clients.